I landed in Spain with food on my mind (shocking I know!) and wanted my first meal to be something traditional; mussels perhaps, or maybe a paella. I’d chosen a seemingly suitable restaurant for lunch but arrived to find the shutters down. It was early so we went for a walk around the town expecting to return to an open restaurant, it wasn’t. Eventually I gave up and concluded it was probably one of the many restaurants in Spain that don’t seem to open on a Monday. With no plan B I had to resort to something I generally try to avoid at all costs, TripAdvisor. I ended up eating pancakes at Esquitx Creperia! Not quite what I had in mind and not very traditional Spanish but lots of fun. Ordering was difficult due to the lack of English speaking staff or menus but through a combination of my limited Spanish, Google Translate and a very patient waiter we got there. I’d have been happy with just the sweet pancakes to be honest but thought I should act like a grown up and so ordered a ‘Ratatouille & Avocado Crepe’. 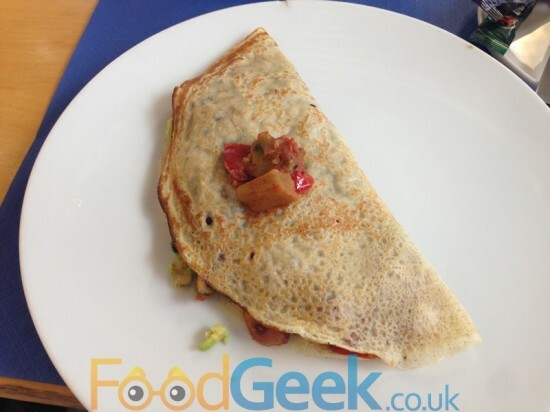 It wasn’t amazing but perfectly enjoyable; a decent savoury pancake with a nice filling of ratatouille, smashed avocado and rashers of crispy, really strong smokey bacon which was delicious. Mrs FG also enjoyed her ‘Mexicano’ which was pretty similar with guacamole and peppers but swapping the bacon for chicken. My sweet pancake was ‘Chestnut Puree, White Chocolate & Vanilla Ice Cream’. I’m not the biggest fan of white chocolate but ordered this on the strength of the chestnut puree which I was intrigued by. I’m glad I did as it was interesting and a really tasty filling. 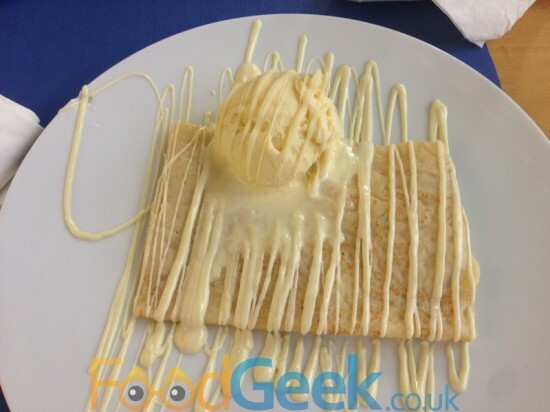 The sweet white chocolate had set on top and added a lovely texture to the soft pancake and ice cream. Mrs FGs ‘Apple, Walnut & Cinnamon’ crepe was really good too. 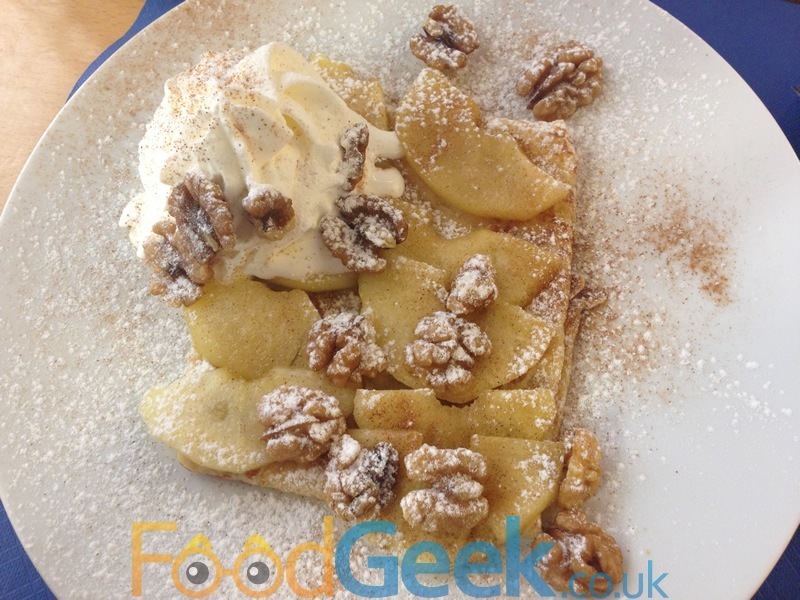 Great flavours that work well together with a lovely soft pancake. What’s not to love? 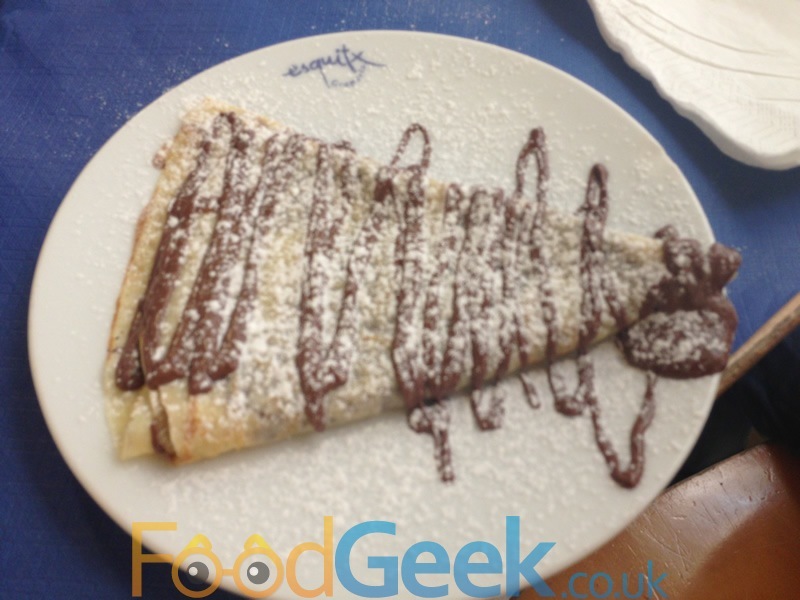 We also tried a ‘Nutella’ pancake which was exactly as it sounded and looked. Simple but rich and delicious. Service was fairly slow but they were busy and there seemed to be only one guy rushing around doing all the cooking and the serving so I tried not to hold it against him. The pancakes were good and there were some other brilliant sounding combinations i’d have liked to try. Overall it’s a fun place serving decent food and pretty good value. I’d be happy to return if I was ever in the area again. Next: Braseria Rosa Mari, Benifallet, Spain – Traditional, Charming & Very Spanish!